Most cars these days do come with tire pressure monitoring systems that alert drivers when tire pressure drops below the set point. However, Nissan's Easy-Fill Tire Alert adds an extra degree of convenience. It helps consumers quickly fill their tires to the right pressures without the use of a handheld pressure device or having to stretch out and check those tire pressure numbers at the station. The use of this system is pretty straight forward. Park the vehicle in a safe location, apply the parking brake and the leave the ignition in the "on" position with the engine off. Once air starts filling the tire, the exterior lights flash to indicate Easy-Fill Tire Alert is monitoring the change in air pressure. Once it reaches the correct tire pressure, the vehicle will sound the horn. If there is an over-inflation, the horn sounds again and the hazard indicators flash three times, signaling the need to release some air. According to the National Highway Traffic Safety Administration (NHTSA), four out of five consumers are driving with improperly inflated tires with either too much or too little air pressure. Properly inflated tires could save consumers as much as 11 cents per gallon on fuel and extend the life of a tire by 4,700 miles. 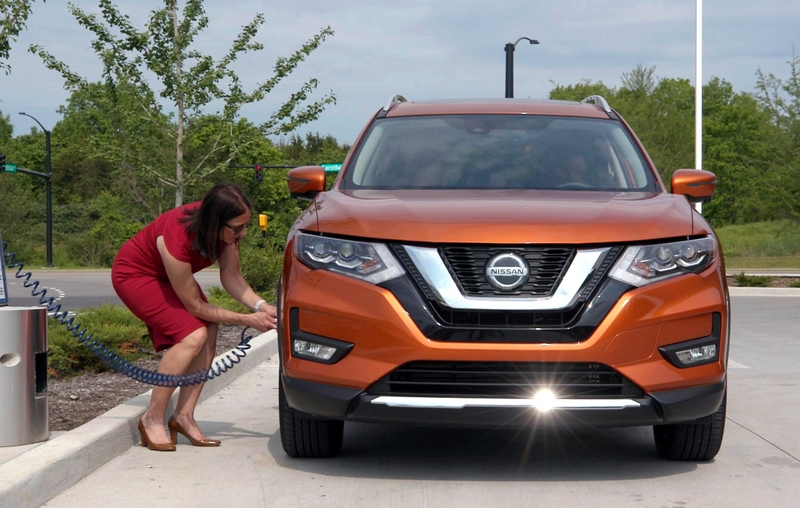 Sarah Cardinali, senior manager, product safety, Nissan North America says, "Ensuring your tires are inflated to the correct pressure is one very simple step consumers can take to help make their vehicles safer, especially with the start of summer road trips." She added, "Nissan's Easy-Fill Tire Alert takes the guesswork out of filling tires and makes simple vehicle maintenance less intimidating for the average driver." In the U.S., Nissan has sold more than 5.3 million vehicles with their exclusive Easy-Fill Tire Alert Technology. That's about 21 million tires. This technology is being offered on 12 different vehicles in the range: Altima, Armada, LEAF, Maxima, Murano, Pathfinder, Rogue, Rogue Sport, Sentra, TITAN, Versa, and Versa Note. Below is a video demonstrating how the system allows underinflated tires to be filled to the recommended pressure in about half the time compared to using a traditional tire gauge. Sweating the small stuff matters. Here's why.